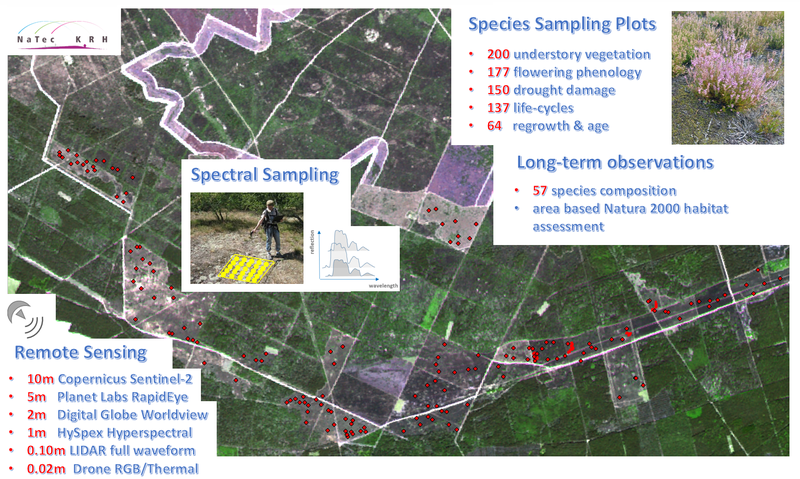 In accordance with digital remote sensing data acquisition, a comprehensive sampling design for the in situ recording of species and habitats was developed for the project NaTec - KRH. Plant species and structural vegetation parameters such as senescence, scrub encroachment, plant height and age were determined on the ground. In parallel, observation areas were defined for the recording of different remote sensing sensors. In different habitat types, permanent observation plots were set up throughout the area used by the Heinz Sielmann Foundation. In particular, vegetation sampling was performed systematically in different states, ages and management measures of Calluna vulgaris stands. A total of 57 permanent observation plots (2 x 2 meters) and additionally 57 small scale plant species plots (30 x 30 cm) and 3 transect plots were sampled. Furthermore, validation areas were identified throughout the entire area of the Kyritz-Ruppiner Heide, particularly for the habitats of sandy-xeric-grasslands, pioneer grasslands and wet meadows. For the selected plots information about the species inventory (vascular plants, lichens, mosses), soil and litter cover was mapped and stored in a data base for further analyses. To compare these with remote sensing imagery, at each plot, spectroscopic field samples were taken to characterize phenology, vitality and growth conditions at regular intervals through the year (May - October). On the basis of several field surveys and taking into account the coverage of as many different habitat types as possible, test areas for the collection of remote sensing data were selected. In total, 3 drone flights could be realized on 12th, 21st and 29th of September. Here, from altitudes of 30 to 100 meters, several areas of the Heinz Sielmann Foundation were flown with simple RGB cameras, but also with multispectral and thermal systems. 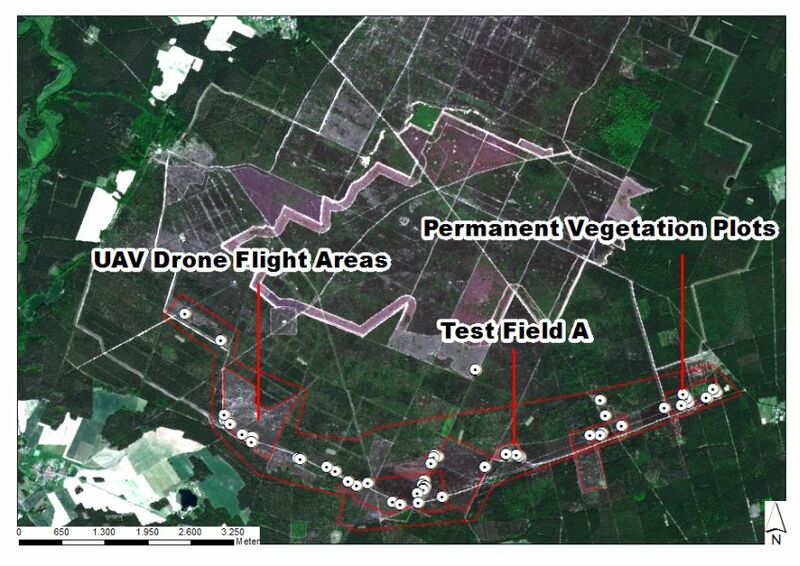 Furthermore, hyperspectral overflights were realized for the entire southern part, which records the state of the heath in up to 350 spectral wavelength bands from heights of 1000-2000m. In both cases, a close cooperation with the FU Berlin was established. Our thanks go to Dipl.-Ing. Kristin Fenske and Dr. Thomas Ruhtz, who provided flight technology and expertise for the respective flights. 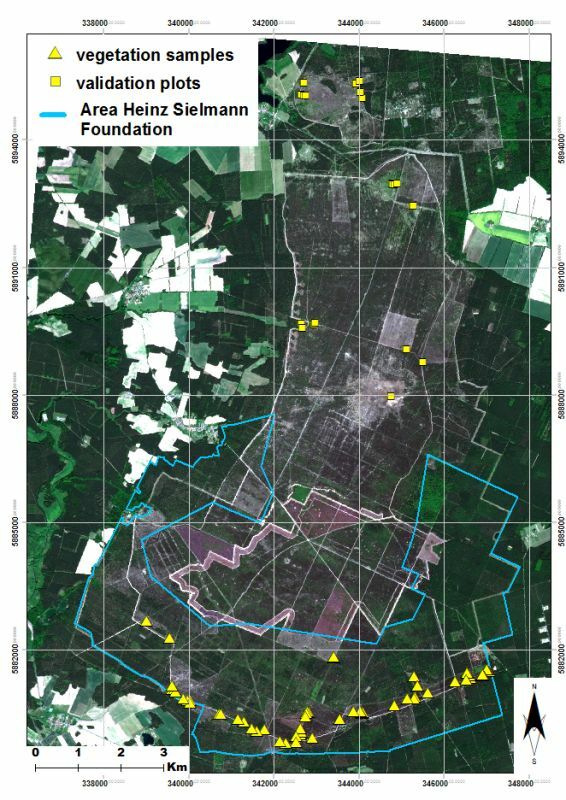 In addition, a large number of multispectral satellite datasets have been procured for the entire area of the Kyritz-Ruppiner Heide. It was possible to create a large image database from several time slices of e.g. Worldview-2, Sentinel-2 and Rapid Eye images. In parallel, measurements were carried out on the ground with a field spectrometer during the entire vegetation period and stored as a reference database.